pigs ... pigs ... pigs - that's what corporate war profiteers are! This is an edited video featuring performance, pigs and speakers from recent Bechtel protest. read above ... this clip is a medium quicktime video by folks associated with Indybay ... VAN ... etc. 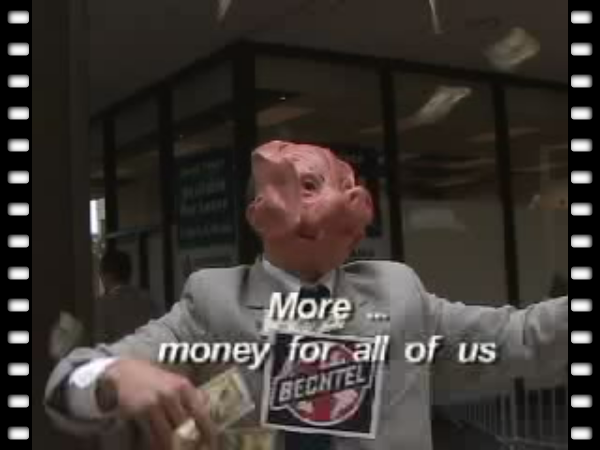 the war pigs video ... Bechtel protest video edit, featuring Antonia Juhasz, John Gibler, Starhawk, Clarence Thomas, Susan Galleymore and the corporate pigs of course ... a must see ... by indybay and VAN-istas.